Objective: Given an array of size of N and number k. Find all elements in an Array which appears more than N/K times. Input: Array  and number k.
Output will be [3,4] they appear 5, 4 times respectively. Naive Approach: Take two for loops , check every element with all other elements, Time Complexity – O(n2) time. We will create a class structure which will store an element and its count. Create array etms contains k-1 objects of class Elements with element =0 and count = 0. So idea is, navigate all the elements of given array. Check if element exist in etms if not, insert it with the count 1 and if exist then increase its count. Also check if etms gets full when inserting an element, if it is not, follow the previous step. If it is full then reduce the count of every existing element in the etms. (Just think of a Tetris game, when row gets full, it gets deleted and size of the Tetris reduced by 1) see the picture below. Once all the elements of array gets over, check every element of etms with array and print those elements which has N/K times. 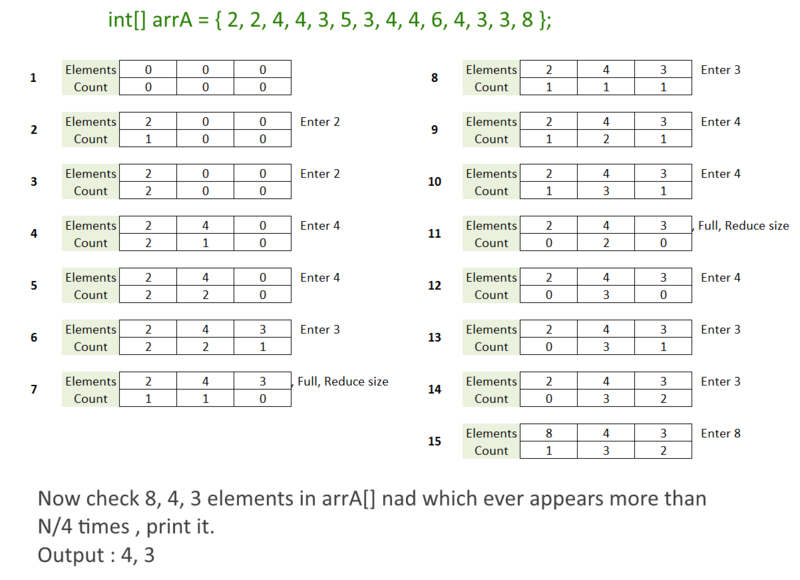 Next story Given an array arrA, find the maximum j – i such that arr[j] > arr[i]. 263 queries in 0.134 seconds.